Are you thinking of reducing waste in your family but not sure you can do it? Are you overwhelmed with the idea of reducing your family’s trash to almost nothing? I’m here to give you an honest look at what it’s like to go for zero waste with your family. Does any of that sound like you? If so, keep reading for the inside scoop on going for zero waste with kids. I’m breaking everything down into two categories. First, I’ll cover the super challenging stuff. THEN, don’t despair, I’ll get into the super do-able stuff. So hang in there – it’s not all tough! First, the super challenging part of zero waste with kids. Let me start by saying –THEIR TRASH IS NOT THEIR FAULT! We live in a linear economy. AKA – almost everything we come into contact with is designed to end up in the landfill. Your kids are part of a system they can’t control. Always remember that – kids are reacting to a system that’s designed to make trash. So, the hard truth of it is this: If you’re kids are gonna be in the world without you by their side, they’re gonna make some trash. That’s the plain and simple of it. No way around it until they are old enough to really care about this themselves. You can help them prepare to be out there. Practice being assertive. Practice saying “no thank you”. Practice polite refusal of those freebies and treats and giveaways and STUFF. But when your kids are young, there are going to be times when they say “YES, PLEASE!” with excitement. Times when the goodie is really inviting and they can’t easily resist. They don’t have an inner voice yet reminding them of the bigger picture. -A spontaneous stop at Starbucks after a school field trip for treats (courtesy of a chaperone) leads to a plastic frappucino cup, lid, and straw. -A visit to the craft fair at an eco-minded event and we suddenly have a plastic craft creation that won’t last long. -Playdate with a friend can lead to trash from a candy bar or hot cocoa cup or popsicle wrapper or some other treat. -Classroom arts and crafts activity could mean dozens of plastic beaded bracelets. Or dozens of plastic bead art designs. Or duct tape crafts. All coming home to our house. -A pinata at a birthday party full of wrapped candy. -A friend at soccer practice hands them a granola bar. -A speaker at school passes out free trinkets after a fun talk. You get the idea. Other grown ups and events and activities in their lives will lead to trash. And it’ll probably come into your house. I’m not always going to be there to intervene. Until they have the commitment and maturity to say no thank you to all freebies, they’re gonna bring home some trash. My preference is to let my kids be in the world even when I can’t be by their side because I value these experiences and relationships for them (not so much the trash). But I know I can’t make the other people around them aim for zero waste too. That’s the tough part. That’s the low down dirty truth of going for zero waste with kids. While your kids are young, you might never get all your family’s trash into a mason jar. Sorry to bear the bad news. Okay, are you ready for the good news now? There’s SO much you CAN do to help your kids go for zero waste. My number one tip is PLAN AHEAD! If you think temptation will come up (e.g. cake at a birthday party handed out with plastic forks, a stop at the yogurt shop during an after school playdate, lemonade in plastic cups at a potluck) get prepped! Talk about it in advance with your kiddo and bring that cup/fork/straw/bowl/plate or snack or bulk bin treat or whatever might get between your little one being a part of the activity and sticking to your family goals to cut waste. 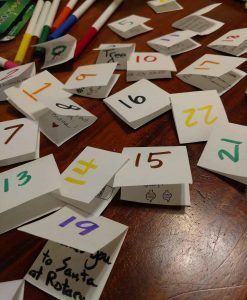 Try to find the activity that doesn’t involve plastic at the craft table and encourage your kids to do the same. Let your kids’ teachers know that you are trying to limit how much plastic comes home with them. Better yet, if you’ve got the time, help your kids teachers with ideas and suggestions for activities that don’t lead to trash or involve plastic (an eco-friendly alternative to plastic bead art? YES PLEASE!). 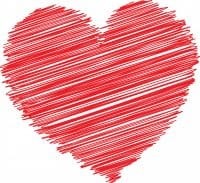 If you are really organized and don’t feel it would be too imposing, reach out to party or event organizers in advance and let them know your family goals and if you can help with party favors or supplies. And, of course, remind your kiddos of the family goals and what challenges might lay ahead. Which leads me to my next tip! My number two tip is to inspire them! Remind your kids why it’s important to care for the earth and that there are so many ways to do that. Remind them why you’re avoiding plastic and cutting trash. Show them pictures of the great ocean garbage patches. Tell them heartwarming stories of human actions leading to environmental changes. For example, did you hear the story of Ryan, a 7 year old in southern California, who started his own recycling company to help the earth and save for college? One child has recycled thousands of dollars worth of cans and bottles from his neighbors. Or did you hear that a camera trap in Gabon’s Bateke Plateau national park captured a photo of a spotted hyena? They thought the animal was extinct in that area! But the work of rangers and other partners to protect animals in this park has led to big game surviving and thriving. And there’s the story of a classmate of one of my daughters who organized a beach clean up at a local beach. So cool! Stories like this are everywhere, and show kids (and grown ups!) that our actions can make a positive impact. Share them with your kids and help them stay motivated toward zero waste! 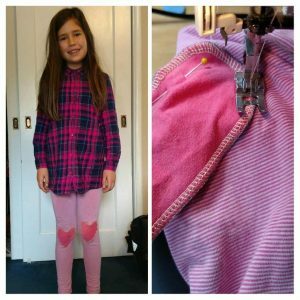 And I have another post just on inspiring zero waste kids – you can read it here. And my third tip is to keep a positive attitude when you talk with folks outside the family about your goals. My personal approach is to use our zero waste supplies without any hub bub. We don’t wave around that we brought our own forks to a picnic. We don’t try to make anyone else feel bad about their trash. In our two plus years of doing this, people sometimes notice and comment positively, or don’t notice at all, but I’ve yet to encounter anyone freaked out or upset by the goals we’re reaching for. So don’t worry too much about how others might react. If they notice and want to talk about it, that’s great! It’s your chance to share what you care about without making someone else feel bad. Your kids will catch on to your attitude, so keep it positive! If you want your young kids to move through the world and make their own decisions, there’ll be some trash. And that’s not their fault. A little planning and prepping can cut out LOTS of your kid’s waste. Inspiring your kids can help them stay motivated. Bring a positive attitude to the non-zero wasters in your life. So there’s my truth about zero waste with kids. We participate in the world around us and still make some trash. But with some energy and planning, we’ve cut back our waste DRAMATICALLY (aka – putting out our small 20 gallon trash can once a month or less) and you can too. What’s been your experience in aiming for zero waste with kids? Any tips to share? I’d love to hear in the comments below! Do you feel overwhelmed by going for zero waste or low waste living? Not sure how to make the switch? I’ve got a few posts for you on easy zero waste meals to help you cut your waste. How about we start with zero waste breakfast?! Going for zero waste means eating more whole foods and fewer processed foods. Lots of packaged food is also processed food. So when you cut out packaging, you cut out some less than awesome food choices too. But packaged food is so convenient – I get it! And there are lots of healthy packaged options out there too. Your mornings are probably busy and maybe even a little hectic, without loads of time to spare. So how do you get a nutritious breakfast without reaching for something packaged? I’m here to help! Check out these top 5 zero waste breakfasts that whip up super fast. Bonus: total kid-pleasers! Vegan options! And gluten free options! You ready? Zero waste breakfast, here you come! This is one of my favorites and I crave these some mornings! If you have kids, you have food scraps. (BTW – if you have kids and you don’t have food scraps, please call me right away and tell me how you do this). Okay, so those scraps – carrot sticks, cucumber slices, half an apple, orange slices, etc. You know the ones. At our house, they sit in the fridge. Pulled from lunch bags at the end of the day, shoved into the dark corners of the fridge. And forgotten. I beg the kids to eat them but it doesn’t always happen. So here’s the solution: pop those forgotten fruits and veggies in the blender for an ugly smoothie! I add a spoonful of coconut butter, a little sweetener, a little water, a little ice. Blend it up and pour! So easy. And super refreshing. And vegan and gluten free! 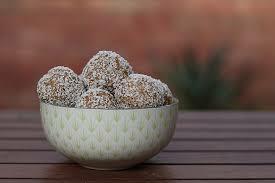 Another option – add cocoa or cacao powder for a richer flavor with added iron. Okay, it might sound dull, but we LOVE toast in our house. LOVE IT! We usually buy bread straight from the bakery – either Gayle’s or Companion Bakeshop. They’ll put it in our own bag (check these bags out here). If we can’t make it to the bakery, we’ll get bread in paper bags – bagettes come in paper bags at most of the big grocery store chains. We recycle the paper if it isn’t stained. Otherwise, we add it to our compost. Not ideal, but better than landfill or plastic! Lately we’ve been eating toast with Miyoko’s vegan butter – it comes in 100% compostable packaging. 0% plastic or bio-plastic. And it’s DELICOUS! But some other awesome toast ideas: peanut butter from bulk and sliced bananas on top. Avocado with tomato and cucumbers, and a little salt and pepper. Almond butter with sliced apples. Or homemade cashew cheese (check out my post on that here) with tomato slices. And homemade jam (I admit, I don’t make this, but I’m lucky enough to have a mother in law who does 🙂 ). So fast and easy. The kids make their own toast. Actually, they make most of these recipes on their own! This has been another go-to for me lately. I make oats with the works and all of it can be found in bulk! We get gluten free rolled oats at Staff of Life. The ratio is easy – cook 1 part oats to 2 parts water. These cook super fast – about 5 minutes for 1 to 3 servings (½ cup dry oats per serving). I add ⅛ to ¼ teaspoon of cinnamon and 1 to 3 tablespoons of raisins (1 T per serving) at the start of cooking. I like the way the raisins plump up and add natural sweetness to the oats. And the cinnamon gives it a nice flavor. Once the oats are cooked, I add peanut butter, shredded coconut, chia seeds, chopped fruit, a little sweetener, and sometimes coconut milk or water (from a can of coconut milk. Although not totally zero waste, cans from the coconut milk are relatively valuable to recycle, so I don’t worry too much about the can ending up in the landfill). Or you can leave the coconut milk/water out. These oats are super filling and full of awesome fiber. Okay, before you skip ahead, let me say that you CAN whip up pancakes from scratch and FAST. We love the pancake recipe from Vegan with a Vengeance (and can find all the ingredients in bulk). The recipe says to let the batter sit for 10 minutes before cooking (or even overnight, covered with a beeswax wrap), but skip that step if you’re in a hurry. 2 T maple syrup or sugar (if you use agave syrup or beet syrup, you’ll need less than 2 T – probably 1 T only). Mix the dry ingredients together, then add the wet ingredients. DON’T OVER MIX! Mix just enough so that most of the lumps are gone. Cook on a hot skillet until you see bubbles form on the top, then flip it over and cook a little longer. We love these vegan pancakes with Miyoko’s butter on top and either brown sugar, fruit, jam, agave syrup, or maple syrup (which we can’t find in bulk, unfortunately, so don’t get that often). If you eat ’em, you know that eggs cook up sooo fast. Sometimes we make omelettes with leftover veggies from the night before. Or omelettes with cashew cheese – yum! Or real cheese, if you can get that without too much waste wrapped around it. We love them soft-boiled, fried, and scrambled at our house. They seriously only take a little time to cook – fried eggs especially can be done in about 5 minutes. And you get some protein for the day! We save our egg cartons and return them to either Staff of Life in Santa Cruz or direct to egg farmers at the farmers market, and they get reused again and again. Love that! That’s what we usually eat at our house – fast, easy, (mostly) zero waste breakfasts. And our kids love these zero waste breakfasts! If you can spare 10 minutes in the morning, you can make any one of these (or all of them!) and avoid packaging waste. What do you eat for breakfast? I’d love to hear in the comments below! We all have our reasons to go for zero waste. It might feel really overwhelming to get a year of your trash into a mason jar – and might be impossible, depending on where you live and what you can recycle. But there are actually TONS of easy ways to cut down your waste. Think beyond the mason jar! Here’s a roundup of 75 ways small ways to cut your waste. Did you know that transportation (i.e., cars) is one of the top sources of pollution and contributors to global warming? Driving less is an amazing way to reduce your waste and have a positive impact on the planet. Check out local bike resources for bike paths and bike-friendly routes near you. In Santa Cruz we’ve got www.bikesantacruzcounty.org for loads of awesome resources on biking safely in our community. And don’t forget to wear a helmet! Each flight you take is a major resource drain. Just like cars, planes are a major source of greenhouse gases. Try some local travel and explore your own part of the country. Or, if you have to fly, offset your flights with carbon credits. And try to limit flights to those that you really want or need to take. If you live in California, we have so many amazing state parks that you can drive to. Check them out here. This is a MASSIVE way to reduce your waste WAY beyond the mason jar. The meat industry is a MAJOR source of pollution. Even if you can’t do this all the time, try swapping out a couple meals a week for vegetarian. Good for you, good for the planet! And there are so many great resources out there. I love Minimalist Baker for vegetarian recipes. Going vegan has even more benefits for the planet than vegetarian. All those animal products really have a negative impact on the climate – especially the dairy industry. Try swapping some vegan meals or vegan substitutes when you can. Or go all the way! Join the millions of others in the world who do it every day. My favorite vegan blog is by my friend and favorite yoga teacher, Amey. Check it out here! This is also a GREAT way to cut down your waste. All those fruit peels, veggie skins, egg shells, and more can go into your compost. No yard? No problem! Try a worm bin that fits under your sink. And if you live locally, check out the Santa Cruz Compost service, which collects your compost by bike! They are here. Dryers use loads of electricity (pun – ha!). You can line dry all year too – some racks are easy to set up in even the smallest space and then fold up to be tucked away behind a door or under a bed. We’ve been dryer free for about 4 years and it’s still working great for our family of four. If we can do it, so can you! We even were mostly dryer free during the cloth diapering days! Tissues be damned! Switch to reusable hankies. I say buy mine here or make your own or look for some in the thrift store. When all of ours are in the wash, I start in on our rag stash for hankies – hey, they’re clean! Any ol’ rag will do. Paper towels can be composted, but why not preserve those resources for more essential goods? We have a stack of about 20 dish towels. We use each dish towel until it gets soiled and then we toss it in the wash. I make some here, you could make your own, or look for them at the thrift store! Try finding all natural fibers – much better for the earth. Those disposable coffee cups are the worst! Some super progressive coffee shops have even stopped handing them out because they are such massive polluters. Bring your own! Buy one from a locally owned business to support the locals. I got mine from Wild Roots in Felton. Love that shop. And you can buy No Trace goods there (another shameless plug!!). 10. Keep a napkin in your purse. How many times have you needed a napkin when you are out and about? This still happens to me sometimes but I almost always have a little napkin in my purse. I make really cute ones here but make your own or find one in a thrift store super easily. 11. Bring a water bottle. You are already doing this, I’m sure. We’ve got to get rid of plastic water bottles! Even though often times you can recycle those, our recycling days might be numbered and these are ending up in the landfill more and more often. Just bring your own. I got mine at Jones and Bones in Capitola. I love supporting local business. Look for what you need in the bulk section of your grocery store. I’ve got a whole post about zero waste grocery shopping that you can see here. Also, i make these gorgeous bulk bags here. Made from recycled cotton. If you can’t get something in a bulk bin, try getting something with as little packaging as possible or in the largest amount possible that won’t also spoil. 13. Shop at the farmers market. Again, check my post here for resources to find farmers markets near you. You can often buy loose produce here that come without those pesky stickers. 14. Stop buying those prepackaged treats. I know they are super convenient. You can do it, though! Just say no. Fruit, anyone? 15. Try making it yourself. Is there something you really miss? Crackers? Granola bars? Hummus? Pesto? Pick a few of those prepackaged treats and try making your own. Read about my favorite easy homemade zero waste snacks here and you can start having snacks on hand whenever you need them! 16. Get your beer in a growler or just enjoy a pint in person. You might not want to pay micro-brewery prices, but you can treat yourself and the planet once a while with something fresh and local. Although you can recycle glass and cans almost everywhere, recycling is not the solution to our problems – reuse is way better. 17. Get your wine from a local winery. They might let you bring your own container for refills. Some wineries even have harvest or tapping parties where you can fill up loads of bottles to get you through the year. Or at least the week ;). 18. Buy your clothes from a local thrift store. Fast fashion is a MAJOR polluter. Think twice before buying new and see if you can find it used. 19. Get your shoes repaired at a shoe shop. Do you have a cobbler or shoe repair person in your town? Buy shoes that are built to last and be repaired. 20. Go to a repair cafe to mend your worn clothes or small appliances or other household items. If you live in Santa Cruz, reach out about repair cafes in town! No Trace has hosted this! 21. Grow your own food. Even if all you have is a sunny window, you can grow fresh herbs like basil from home. If you have more space than that, consider planting some trees and growing what you can. In northern California, we can grow some veggies all year like kale, chard and lettuce. These are good for the soil! Fibers like cotton, hemp, and linen can be composted at home. 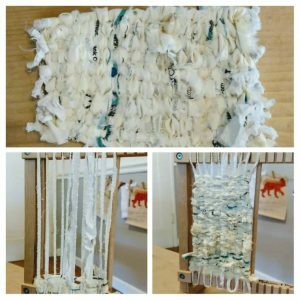 I wrote a post about keeping fabric out of the landfill here, so check it out for more tips. 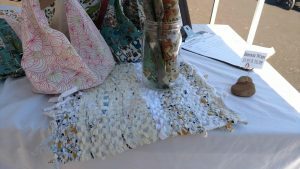 If something is beyond repair, not useful as a rag, and not compostable, find a fabric recycler. Some cities have curbside fabric recycling (San Francisco! I’m so jealous). If something has a small stain or tear, don’t toss it – mend it with sashiko stitching. This is a beautiful way to fix something. I get loads of inspiration from Miniature Rhino. Check her out here. 25. Try canning your own food. Zero waste chef has loads of great resources on this topic. When tomatoes are in season, you can stock up and then make some awesome canned tomatoes for all your cooking needs during the year. Or make some fresh fruit preserves. Yum yum. Read her amazing blog here for loads of home canning and preserving tips. 26. Make your own Kombucha. Another zero waste chef specialty. Eliminate all those bottles you might recycle and make your own. Save money, too! Check her out here. Try to avoid synthetic fibers and toxic resins in the furnishings that surround you. Buy high quality pieces that can be repaired rather than tossed out. I wrote a piece about building a simple bench at home that you can read here. It’s important that we think about the full life cycle of what we bring into our homes. Might be obvious, but try getting comfy with your laptop rather than a print out whenever you can. All those papers can be recycled, of course, but why not preserve those resources for things we really need? Need a break from the desk? Move your laptop around and try reading in a different spot before thinking you have to print something. I love this one for kids. We try to avoid “filler” gifts – little things just for the sake of giving something – unless it’s meaningful and sustainable. I’ve got another post on that here. Be prepared and bring a kit to help you avoid trash on your travels. Read my post here about that here. 32. Plan for a zero waste Christmas. We give lots of gifts, but we avoid plastic. We also wrap in fabric that we can reuse, rather than in paper. I make these adorable furoshiki wraps here but any old fabric will do. Keep the food and drinks simple and you can avoid all that trash! 34. Loan utensils, plates, cups, napkins to friends for their parties or borrow some for your own. Some communities have lending libraries for big events. Ask around to see if yours does. If you’re going to a party and you’re not sure what they’ll serve on, bring your own stuff. Also, don’t leave it in the car and forget to bring it into the party like I sometimes do! We’ve got awesome Grey Bears in town for this amazing service but check your local waste management agency for ideas. 37. Make your own deodorant. I use the recipe by Trash is for Tossers, but you can find loads of free resources online. 38. Swap out some beauty products for what you can find in bulk. For example, you might try some light body oils or even lotions in bulk. Sunscreen even if you’re lucky enough to have it in your town! Lots of folks make citrus vinegars with citrus peels and use this for cleaning instead of packaged cleaning products. And isn’t it nice to know what’s in your cleaning products? Can you swap in some colored pencils and all natural crayons? 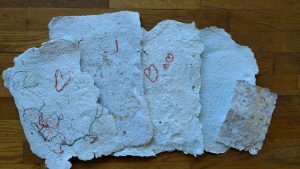 Use recycled paper? Get your school supplies at the thrift store? A little effort can help cut down on trash from school. 41. Recycle old markers with TerraCycle. At The Art Factory in Aptos you can drop your worn out markers off to get recycled! Hooray! Check around for TerraCycle options near you. 42. Make your own cough drops! Okay, I found a pin for this on Pinterest and admit – I haven’t tried it yet – but I’m sooo excited to try it out. It’s on my board here. No more canned beans. Seriously. We don’t buy these any more. Hip hip hooray! Save yourself time and money by making these at home. You really can cook beans in a flash with one of these. Works great for rice, artichokes, and other food that can take a little time. If you can prep out some meals and snacks on Sunday afternoon, it’ll make the week go more smoothly. I love doing a bunch of salads in a mason jar, or making a pot of beans, rice, and some roasted veggies to last for a few days. And I try to plan for quick snacks to have on hand for after school and other busy times. No more disposable razors! The Zero Shop SC sells them – check them out here. And there are loads of resources online for how to shave with a safety razor too, so get some help and make it easy for yourself. 46. Buy shampoo and soap in bulk. We bring our own containers and refill them at our local bulk store – Staff of Life in Santa Cruz. We weigh the jars, but some stores will ask how many ounces your container holds, so it’s good to know that too. Also, you might be able to find unpackaged bars of shampoo, conditioner, and soap in your town. Lush offers these too. 47. Switch to reusable menstrual products. I found reusable pads on Etsy that I love. There are loads of others on the market now too. Reusable menstrual cups are also available in lots of natural food and bulk stores – maybe in your local pharmacy too. I found mine at CVS! In Santa Cruz, New Leaf Market on 41st Avenue has a TerraCycle box for recycling Tom’s packaging! Yay! You can call around to see if there is some place near you as well – schools sometimes have TerraCycle boxes. I haven’t found the perfect solution for compostable floss yet, but Dental Lace will breakdown in your home compost. Unfortunately, it does come in a plant-based plastic bag, which may or may not breakdown in your home compost. But it does create less waste than a big plastic box full of plastic floss. Easy peasy! Usually you’ll have to pull out the nylon bristles before you can compost it, but it beats throwing out a whole plastic toothbrush! Seriously, this is so easy and will save you loads of money, too! I make mine with 1 cup water, 4 tsp baking soda, and a few drops of essential oils (4 of tea tree and 4 of peppermint). 52. Make your sunscreen or find it in a reusable container. I’ve got a recipe from PareDownhome.com that is super easy to make, although the ingredients might be hard to find, especially not in plastic. I’ve also found sunscreen in reusable, plastic-free containers from Raw Love and Elevated Sun. I personally preferred Raw Love to Elevated Sun – I found the latter a little gritty when putting it on. But I LOVE what they are doing. 53. Make your own lotion. Have you made your own body cream before? It’s an awesome chance to make something just the way you like it – adding in whatever scents you’re drawn to. Check out my Pinterest boards for recipes! 54. Make your own shaving cream. Or just use conditioner! One less packaged thing to buy. 55. 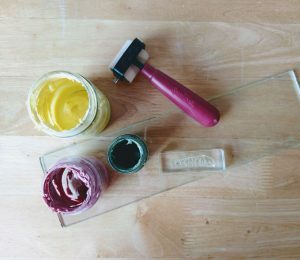 Buy zero waste makeup or make your own. I found this shop on Etsy and LOVE the lipstick we bought. Highly recommend for vegan, zero waste, all natural make up. 56. Switch to metal and fabric hair accessories. Another area of your life to cut down on plastics and trash. But use up what you have first! Kooshoo makes biodegradable hair ties, but have shipped in plastic bags in the past. 57. Use a wooden hair brush. When it’s time for a new brush, trying getting one that’s plastic free. Yes, sounds gross, but it composts! Nails do too. Is that TMI? Sorry not sorry ;). You don’t have to be a minimalist, but the less stuff you have, the less waste you’ll make. This is so true for kiddos. So many of their things – especially those freebies and party favors – end up as trash. 60. Buy the bruised veggies and fruits at the store. If you know you’ll eat them soon, you can save them from the landfill! Lots of stores will toss out old looking produce, even if it’s still edible. 61. Finish the old before buying new. I’m talking about the food in your fridge – you can toss less food out if you just put in a little more effort to finish what’s there first. Bonus – save yourself $$$. 62. Eat old before new food. Same idea as above – if you do need to shop before your fridge is empty, try getting through the old food first. 63. Give the uneatable to your animals. Have you had kids or friends over, and one of them doesn’t finish the food on their plate? If your dogs or chickens tolerate human food, pass the leftovers on to them. I’ll finish my own kids’ food or ask them to at another time, but I’m not going to eat outside the family. I’m sorry, that’s just not my style. 64. Compost that pizza box. Yes, we still order pizza sometimes in a pinch or when we are just too pooped to cook or go out. But you generally can’t recycle a pizza box because of food contamination. So tear it up and add it to your compost. 65. Bring a container for leftovers whenever you eat out. Have you ever ordered a little too much, and then been torn about tossing the food vs getting a to-go container? Try packing a jar or tupperware in your bag so you can pop those leftovers in your own container. 66. 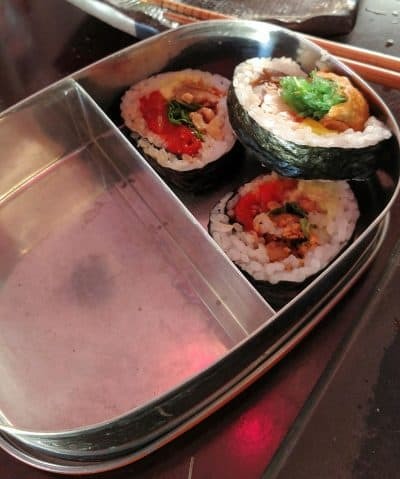 Get take out in your own container. Ask your favorite place if they are open to this – you might be surprised. Our favorite Thai restaurant in Soquel (Sawasdee’s) let’s us bring our own containers. Let them know on the phone and then get there early enough so they can put it right into your bins after they cook it. 67. Remind folks – NO STRAW! – when you eat out. If you have a reusable straw, put it on the table to remind you to say No Thanks to the straw. 68. Have a low water lawn. Water is a precious resource too, and if you care about reducing your waste, you care about preserving water. Succulents are gorgeous little water savers and I love this website for loads of good succulent info – sunshineandsucculents.com. But there are tons of other awesome low water lawn ideas out there in the world. 69. Drive a low emission car. Tesla? Yes, please. I’d love one of those. But for the average person, a Nissan Leaf is great electric car. Seat warmers! Back up camera! That quiet, quiet engine. I highly recommend one – it doesn’t go long distances, but works for closer ranges. 70. Conserve energy in your house. Energy can be a massive polluter as well, depending on the source. We try to be mindful of our energy use in lots of ways – using LED lightbulbs, wearing layers in the winter to reduce our heating requirements, turning off lights when we leave a room and the home, and having energy efficient appliances like dishwashers, washing machines, refrigerators, and microwaves. 71. Try to follow recommended energy conservation hours in your town. For most places in the U.S. (and elsewhere) energy requirements are greatest during the day, when we’re all up and about and doing stuff. So daytime hours put the greatest strain on our power plants, and certain peak hours require the use of some of our less efficient, more polluting power plants to keep up with energy demand. So, to help out, we run the dishwasher late at night and try to run the washing machine early in the morning, outside of these peak energy use hours. 72. Order it plastic free. Online shopping is so convenient, right? Especially when you’ve got a job, a family, and all those other life obligations. So when you order online, always ask them ship your order without plastic packaging. 73. When businesses mess up, let them know. On the same note, if you are trying to order plastic free and the business doesn’t follow-through, write to them and encourage them to cut down on packaging. Try tagging them in social media or commenting on their own posts. A little encouragement can go a long way. 74. Say no to freebies. Free sample in a plastic cup? Free packet of energy goop at the store? Free bag of crackers? Just say no. You don’t need it. The more we all say No Thanks, the more businesses will think twice about these practices. 75. Get your kids or partner or roomies involved. You can ready my post all about getting kids into zero waste here. There you have it – 75 small ways to cut your waste. What’s easiest for you? Which is the most challenging? Share in the comments below! You might be hearing this phrase a lot lately – zero waste. But what is zero waste? I’m going to give you a quick and easy overview of zero waste. So let’s go! In simplest terms, zero waste is about not sending anything to the landfill or creating any trash. On a deeper level, zero waste is the idea of keeping our resources in circulation and in use; reducing or eliminating the need for landfills, and is one result of a circular economy (an economy where products are designed to stay within a cycle of use and reuse). In a circular economy, each phase of a product’s life is connected to another, and disposal in a landfill is avoided. So zero waste is actually a key piece of a new way of thinking about the resources that we use to sustain ourselves. We all know that there are a limited number of resources to support us humans and other creatures and plants on Earth. 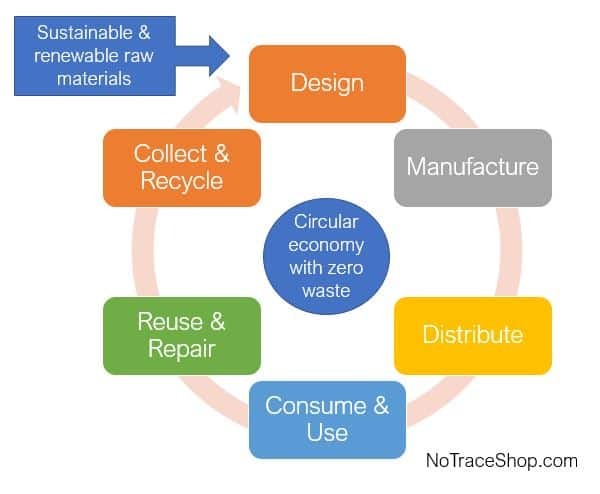 Zero waste and the circular economy are connected ideas of truly valuing those resources and planning for the use and reuse of those resources. Zero waste is a concept that applies to all the things we interact with our lives, from our roads and buildings to our breakfast, lunch, and dinner. In a perfect world, zero waste would look like this: any product that is created (and a product includes everything from the walls of your house to your breakfast cereal) starts with sustainable and renewable raw and/or recycled materials. The manufacturing of that product results in no waste. The product is delivered without waste (e.g., transportation powered by renewable energy). The product is used and is either completely used up (e.g., breakfast cereal is completely eaten without any waste) or is used until it needs to be repaired, in which case it is repaired. Or, the product is used completely and can no longer be used again, in which case it’s collected and remanufactured back into that product, or into another valuable product, that enters this process and stays in the circular economy. Here’s a way to visualize a circular economy with zero waste. As an individual, we can take steps to do our best to reduce waste and live more sustainably. The first step is to refuse – say no to those things that you don’t truly need. For some zero wasters, this includes refusing all gifts and freebies. In theory, refusing will result in much less waste and can be applied most broadly to all areas of your life. The second step is to reduce what you consume. This goes for all areas of your life – the size of your home, clothing, beauty products, etc. It also applies to things like air and car travel – these also have huge impacts on the planet. The less we consume in general, the less waste we create. Some zero wasters strive for a minimalist lifestyle. Living closer to minimalism reduces the things you bring into your home and life and, as a result, the trash that you create. The third step is to reuse. How can you reuse things in your life? Rather than tossing something, repurpose it. For example, clothes that can’t be mended could be turned into rags. A broken shelf is repurposed into something else functional. A jar that held your jam is reused to hold leftovers. The fourth step is to recycle. This should apply to fewer things in your life because recycling is not a great solution to reducing waste. In fact, much of what we send to our local recycling plants doesn’t actually get recycled. In a circular economy, recycling would be even more effective. But as things stand today in 2018, recycling is a smaller piece of living sustainably, relative to refusing, reducing, and reusing. The last step is to allow things to rot. Anything that is compostable should be composted once it reaches the end of its life, but again this should happen only after refusing, reducing, reusing, and recycling. Although compost is important for healthy soils, it’s more important to preserve our resources and keep them in use, rather than dispose of them as compost. If you are new to composting, search around for tips and resources. Anyone with a space for a small bin can start to compost, even without an outdoor space. Local cities and communities might have compost pick-up available. And anything that is made of 100% natural materials and has not been heavily processed in a way to change its composition can be composted at home. Things like bioplastics and bamboo rayon come from plants but have been heavily processed – they cannot be composted at home but there may be recycling options near you. 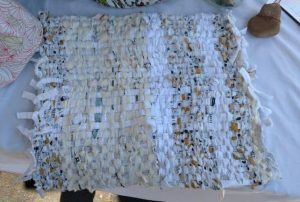 Other things like cotton fabric, paper plates, food scraps, wood scraps, etc. can be composted at home. So there you have it – an introduction to zero waste at both the large scale and individual level. 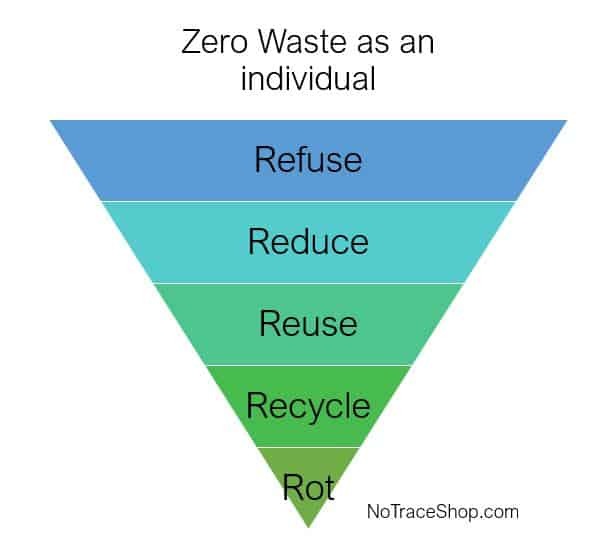 Where are you at on your zero waste journey? And what’s been hardest for you? Share in the comments below! 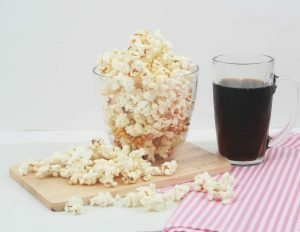 My 4 favorite easy homemade zero waste snacks. I LOVE to have snacks around the house for me, for my kiddos, and for their friends that come over to play. Snacks are the best! H-anger, be gone! But it can be hard to find snacks that aren’t packaged in plastic. Like crackers. I miss buying crackers. Ya feel me? So I’ve slowly built up a little repertoire of easy homemade zero waste snacks I can whip up when needed to feed me and any hungry pint-sizers. And today I’m sharing my 5 favorites! Here are my 4 favorite easy homemade zero waste snacks. I got this recipe from Minimalist Baker and make it ALL.THE.TIME. The awesome thing about it is that it only takes about 10 minutes to make it. No nut soaking required. And you can make it on any blender or food processor – no fancy or powerful equipment required. AND it works great even if you don’t have all the ingredients – just use what you have. The way I make it, it comes out like a thick spread. You can also add hot water to make it more saucy and dip-like. But the spread is great for a quick snack with ANYTHING. Put it all in a blender and blend it up! Ta-da! Done! And sooo good. Like I said, this stuff is great with sooo many things. And it keeps pretty well in the fridge too. These are SO yummy and filling and satisfying. Bonus: they also satisfy your sweet tooth! These are probably the most involved to make of all of these easy snacks, but you can definitely whip up a dozen of these in about 10 minutes. You can also customize these to your liking and swap out or cut out some ingredients. This is also based on a Minimalist Baker recipe. What can I say, I love her food! Blend the dates or other dried fruit into small bits. Add everything else and pulse it together. Roll it into balls as big or small as you like. Optional: roll the balls in shredded coconut. Optional: put them in the fridge to set, or just start eating them! So good. Totally worth the 15 minutes to make them. Okay, these are super fast to prep! But do you need to have some chickpeas on hand. We cook a big pot of chickpeas about every other week. Sometimes we freeze some, but usually we eat them up pretty fast. I love to make bean salads with them, and we also do a lot of chana masalas and soups. Gotta love the chickpea – such a flexible little bean. So, if you don’t already, this might be another staple to add to your fridge. Pre-heat oven to 400 or 425 F (depending on how hot your oven gets). 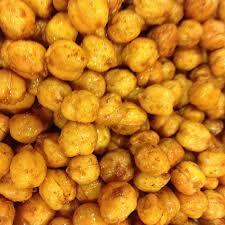 Put your chickpeas on a clean dish towel and roll them around to dry them out. Spread them onto a baking sheet, making sure they aren’t too crowded. Drizzle them with olive oil, and add salt, pepper, and any other spices. Toss them around a little on the sheet so the seasoning spreads around. Bake them for 15-30 minutes, depending on how crunchy you like them. *Note that you will want to stir them around a couple times while they bake. These are SO good. I’ll eat them on their own or add them to a salad. Yum yum. This is my all time favorite easy homemade zero waste snack. Hands down. I probably eat popcorn about 3 times a week. Seriously. I love it. Kids love it too. Duh. I make sure to have popcorn kernels on hand ALL of the time. For me, the easiest way to pop it is with an air popper, which you can probably find at a thrift store. I like to then drizzle olive oil, nutritional yeast, and salt on it. SO GOOD! You can also pop it on the stove in coconut oil – also delicious! You have to keep a close eye on it, though, and constantly shake your pot as it pops. It might also take you a few tries to figure out the best heat to pop it at – sometimes I have lots of leftover kernels when I pop this way, sometimes they burn. I definitely haven’t mastered this technique, but it sure turns out tasty! 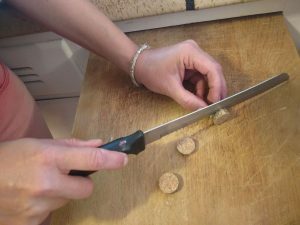 Another easy popping technique is with a paper bag in the microwave. You can reuse the bag a few times. Add the seasoning after you pop it. Yum and easy! So there you have it – my 4 favorite easy homemade zero waste snacks. Do you make some of these too? Or do you have some favorites of your own? Let me know in the comments! I love hearing from you. Top eco-friendly lunch kits for kids – plastic-free! But I also know that school will start up again in the blink of an eye! And with school comes LUNCHES! Our weekday mornings are usually a little hectic – we make breakfast, walk the dogs, make our lunches, and gather up whatever we need for the day (dance today? Piano? Permission slip? Bake sale? Your friend’s shoes need to be returned? You get the drift). In case you were thinking it – I know we are a little overscheduled at times! To say the least. BUT, we do have our morning lunch packing pretty well figured out and I thought I’d share it with you in the hopes that it can make your morning just a teensy tiny less hectic 🙂 . BONUS: our approach is a greener way to pack your food! So, for all you busy parents out there, or parents to be, I thought I’d take a moment to talk about some of my favorite eco-friendly lunch kits for kids that keep your kids safe from plastics and also keep the planet healthy! No packaging, no waste! So here they are: Top eco-friendly lunch kits for kids (and adults!) – plastic-free! Bentology insulated food jar is great for warming before school leftovers and keeping them pretty warm until lunch time! The container is stainless steel, although unfortunately there is plastic on the lid and base of the container. Thermos brand makes an insulated food jar that is almost entirely stainless steel, but it comes with a couple of plastic containers. Thrift store thermos – if you can find a wide-mouth thermos for food at your thrift store – buy it!! And consider yourself lucky :). Planet Box: I love their stainless steel lunch box and my kids do too. It has separate compartments to help portion out different types of food. In our house, we ask the kids to pack a fruit, veggie, carb, and protein for every meal. Sometimes they take a small treat like chocolate chips too. What can I say – I’m weak! Let me recommend that you say no to the magnets, though. These are hard to recycle once the stickers are worn out. LunchBots: This company makes some great 100% stainless steel lunch containers with separate compartments or a single compartment. We love using our two-compartment box. Sometimes we’ll grab one other small container if the two-compartments aren’t quite enough for our food, or we want to keep things separate. Tiffin lunch box: These are stainless steel lunch bins that connect together in a sort of tower. We haven’t used one in our home, but I do see lots of rave reviews from other zero wasters. LunchBots holding veggie sushi – yum!! Sandwich bags: These are a super easy way to tote a sandwich or pastry for lunch. Simply fold it open, pop in your food, and fold it shut. Easy to wash, reusable, biodegradable. I would encourage organic cotton only for these – non-organic cotton could potentially leech chemicals into your food. Also, nylon-lined bags, although nice for moisture, are not biodegradable and nylon is a synthetic fabric that is essentially a form of plastic. Check out my offerings here. Beeswax wrap: If you are worried about keeping your sandwich really moist, or if your sandwich is really drippy, a beeswax wrap is another great way to tote your lunch. These are super easy to clean (wipe or rinse off between uses) and are 100% biodegradable and all natural. I make mine with organic cotton, beeswax, pine gum rosin, and jojoba oil. They last over and over again about a year. If the stickiness starts to wear off, you can also use a rubber band or string to keep it shut. See mine here. For older kids only – A mason jar is a great way to store food that doesn’t need to be kept warm. But I wouldn’t recommend a jar for kids under 7 unless they are pretty careful. And you’ll still have to remind your kiddos not to throw their lunch bags on the ground. These are a great alternative to paper napkins – reusable, biodegrable, and sustainable. 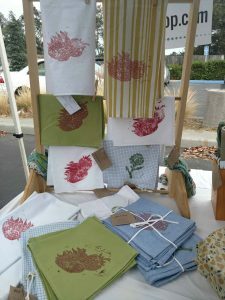 I make organic and upcycled napkins that you can see here. Help keep those finger tips tidy! Camping utensils: I love our Coglan camping utensils – they are stainless steel, small, and super affordable. We got them at a local camp store. And we don’t feel bad if they get lost since they weren’t too pricey to buy. Thrift store utensils: these are even more more economical. You might be able to get forks and spoons and knives for under a dollar each – maybe even all three for $1. Check around and see what your options are. Of course I make these too! But I would recommend ANY cotton or all natural fiber bag over the typical plastic-y, lined lunch bags, which are sadly destined for the landfill. Unless you have some spectacular recycling resources near you. We don’t. All natural materials like cotton, bamboo, linen, and hemp are much better choices for toting your lunch. I would avoid nylon or other synthetics. You can see my offerings here. Last but definitely not least. I’ll be honest that we also use some old plastic tupperwares on occasion that we bought or otherwise acquired before going zero waste. These come in handy and sometimes everything else is sitting in the sink, waiting to be washed. I would encourage you to use up what’s on hand rather than spending a ton on new supplies! If you’re just getting ready to send your little one off into the world with a lunch, start out green and eco-friendly with any of these reusable, sustainable options. These are all awesome ways to send your kiddos into the world with a plastic free and waste free lunch. Do you have any favorite eco-friendly lunch kits to recommend? Or awesome thrift store finds? Leave a comment below! And thanks for reading.